Our martial arts classes for women are uniquely designed to empower women and maximize their learning experience. We have been teaching our martial arts classes for women since the late 1970’s. Initially our goal was to teach basic self-defense techniques that anyone could execute with minimum training. However, our students dedication, motivation and performance allowed us to expand the curriculum and introduce more complex techniques into their regular classes. 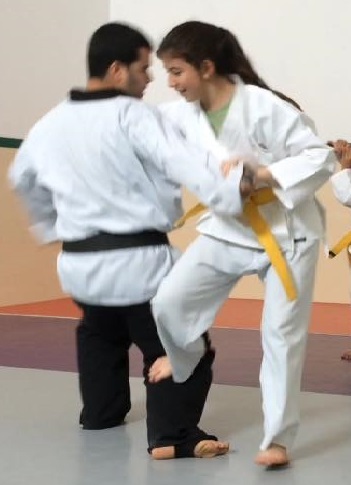 The beauty about our martial arts classes for women and the outcome of the same is that they didn’t need to sacrifice their femininity to become great martial artists, if anything, the opposite has become true. Grace, flexibility, and muscle memory allows them to be ready and quite dangerous if attacked without having to depend on bulkier muscles to carry on the day. 1. The power of the hips. From the anatomical standpoint the female pelvis has evolved to its maximum width for childbirth. Wider pelvis require more of a swing motion in order to create bipedal locomotion. This basic swing is the basis needed to create force when kicking. 2. Women are flexible. There are a couple of reasons for this flexibility which may indicate a higher flexibility of women in comparison with men. First and foremost is the hip area. Women have a shallower pelvis than men which in turn allows them a greater range of hip motion. Also women have less muscle to stretch through which facilitates movement. Last but not least is the hormones factor as women have hormones designed to relax their bodies which in turn “facilitates” childbirth. 3. Women do not rely on strength and normally do not train to get bigger muscles. This means that they are more susceptible to learn how to use their bodies to complete a technique rather than a particular body muscle. As it relates to our martial arts classes for women this is excellent as we based our techniques on body movement and relaxation rather than strength. Yet we do not limit our curriculum to self-defense alone as we also train them on leadership skills, problem solving techniques, resource utilization, communication and many other skills needed to succeed in life. Pair those with a balance workout and a fun environment and you come out with teh perfect combination for women of all ages. On the darker side, while it is our opinion that all women should take advantage of our classes, the reality of the case is that in today’s world no women should consider a pass at this opportunity. Based on several databases we compiled a sample of the current statistics affecting women and the need for martial arts classes for women. Stalkers victimize approximately 5.2 million women each year in the U.S, with domestic violence-related stalking the most common type of stalking and often the most dangerous. One in ten 9th-12th grade students were physically hurt on purpose by a boyfriend or girlfriend in 2009 alone. One in five women have been raped in their lifetimes, and nearly 1.3 million women in the U.S. are raped. With that in mind our martial arts classes for women are not based on the competition world but on the practicality of applications. We do want to make these classes fun and safe but without compromising the effectiveness of our techniques. Contact us today and schedule a free class. Even better, bring a friend or loved one and start a lifetime experience that will change your life.